This guide explains how to use promotional/discount codes within Event Espresso 3. As of Event Espresso 3.1.36 promotion codes can be either ‘Global’ or ‘Non-Global’. The Promotion/Coupon manager allows you to add/edit promotional codes. These codes need to exist before a registrant can use it during the registration process. Promotional Code – This is actually the code that will be required for the registrant to receive the discount. The promotional code input here needs to be unique. Price Discount – This is the amount that will be used to calculate a discount amount. Is this a percentage discount? Y/N – This tells the system whether the price discount amount will reduce the price by a percentage amount or a whole dollar amount. If you want it to be a discount, select Yes. If you want the discount to be a whole dollar amount, select No. Global (Apply to all events by default) Y/N – This tells the system if the promo code is to be available to all events that are accepting promo codes by default or only event’s which you specify to use that code. If you select Yes the promo code will be classed as global, selecting No will class the promo code as non-global. The promotion codes do not expire with time or with use. If you are looking for coupons which do expire, you can try the Social Coupon integration which can be used to provide single use ‘100% discount’ codes. ‘No Promo Codes’ – The event does not allow the use of any promo codes. 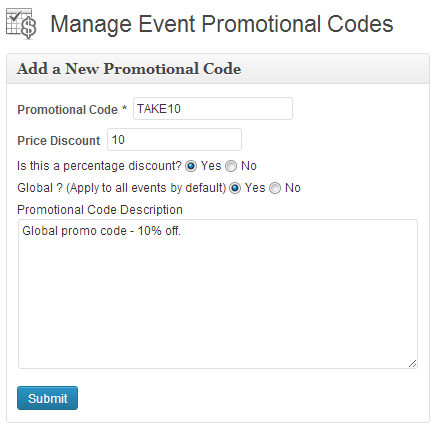 ‘Only Global Promo Codes’ – Allows all promo codes that have been classed as global to be used within the event. 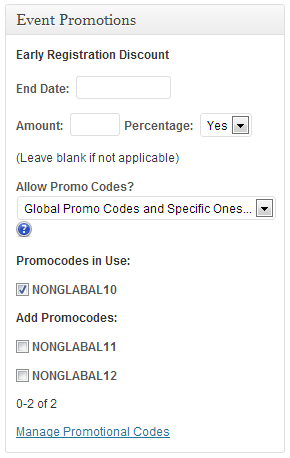 ‘Global Promo Codes and Specific Ones’ – Allows all global promo codes and also allows you to select non-global codes which can used within the event. ‘All Promo Codes (even Non-Globals)’ – All promo codes, regardless of type will be available for use within the event. If you are using Multiple Event Manager, the cart by default does not allow codes to be used. You can turn on this feature by going to General Settings and changing the “Allow discounts in the shopping cart?” option to Yes and saving your settings. As of Event Espresso 3.1.29.1, the promotional codes discount each ticket purchased, rather than the total of the tickets purchased which happens in versions prior to 3.1.29.1. Also if you are looking to provide bulk discounts, we have the Volume Discount add-on.